Files with the CUI extension are Customize User Interface files for BricsCAD. These XML format files replace the previously used menu definition files (*.mnu *.mns). CUI files can be edited with the build-in interactive editor, launched by the CUSTOMIZE command. You can migrate CUI files between BricsCAD versions and combine them between different computers. The Load partial CUI file ... procedure accepts IntelliCAD menu files (*.mnu *.mns) and converts them to CUI files. In Windows: Hover over a toolbar or a blank portion of the toolbar area, then right click and choose Customize in the context menu. In Linux: Hover over a blank portion of the menu bar, status bar or toolbar area, then right click and choose Customize in the context menu. Type customize in the command window, then press Enter. 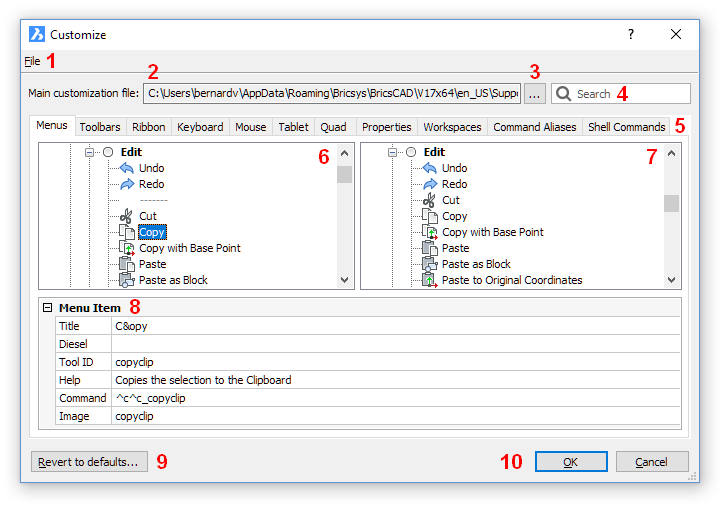 Type cui in the command window, then press Enter. Search field: type a search string then click the looking glass icon, click again for the next hit. Reloads default menus, toolbars, etc. overwriting the customized default.cui file. Saves changes and closes the Customize dialog. Closes the Customize dialog, without saving changes.